Vålågårdens Camping lies right on the banks of the fast-flowing River Vålån in Östra Vålådalen. There is no easier place in the mountains of Sweden from which you can reach the treeline – it is only an easy 2 km walk or ski tour away, along the path to the mountain called Ottfjället. Tourists can park their caravans at Vålågården mountain campsite in Östra Vålådalen for a night, a weekend, a week or the entire season. 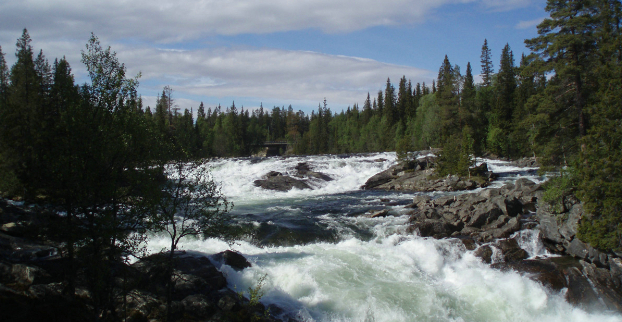 Just around the corner is Vålådalen Nature Reserve. You can also choose to stay in one of our cottages or our youth hostel. Those who want to cook their own food will appreciate the local Jämtland specialities available at Viltbutiken and the riches of the River Vålån.